This event was organised by Elwyn Jordan to raise funds for research into childrens cancer, in memory of his grandson Joshua Bell, who passed away in January 2015 from a brain tumour. It is an afternoon for motorcycles and classic cars. Entry is by donation, of $10 per vehicle, with all money going to The Kids Cancer Project to assist research into children's cancer. The event is on Saturday 21st April, 2018, at 2pm. With this event, the "run" is really all about the destination, which is Dapto Anglican Church Hall, Moombara St Dapto. That is where the event is. Your travel to there is not part of the event, and there is no set route to get there. But I've suggested different routes so that people can choose how they might enjoy getting to the event. Just plan your day so that you arrive at the church hall at 2pm. (See maps on How To Enter page). Your entry automatically puts you in the running for a variety of prizes, and there are more prizes available through raffle tickets sold on the day. The inaugural event was held on 30th May 2015; so this year will be the fourth time it has been run. In total, from the previous three runs we have raised almost $7,000; which was all given to help research into childrens cancer. In February 2014, Joshua was diagnosed with a brain-tumour. 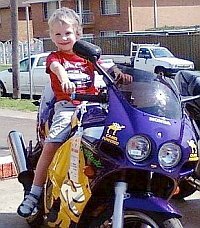 He was taken to Sydney Children’s Hospital at Randwick where a few days later he was operated on to remove the tumour. Initial indications were that it was a low-grade, non-aggressive type, but, after extensive testing of the biopsy, the results were much worse than expected. The tumour was found to be a rare and aggressive form of tumour. He was given a 6-week course of daily chemotherapy and radiation treatment. The chemotherapy was administered at home, but the radiation required taking him from his home in Dapto to Randwick 5 days a week. He finished his chemotherapy and radiation treatment in May 2014. But soon afterwards he started getting extreme headaches again. 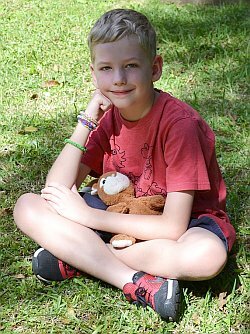 In June, just before his 8th birthday, an MRI showed that the tumour had regrown. Having shown itself to be resistant to chemotherapy and radiation, the specialists concluded that his condition was terminal. At that time he was given an expectation of only weeks to live. However he fought very bravely, and continually amazed the specialists by defying their predictions, courageously fighting the disease that he knew would one day take him from this life. He passed away on 5th January 2015. Joshua often came with me on classic car runs, usually accompanied by one of his brothers. He enjoyed the drive, often with his favourite music (Foo Fighters or Bruce Springsteen) blasting from the car's stereo. He also came with me to bike shows, and other events. And if we called into a bike shop, he always wanted to have a sit on the bikes; and I would take his photo. So having an event of this nature is, I think, an appropriate way to raise funds in his memory. He was always an absolute joy to take to these events: always so well-behaved and good company for me. He will always be very much missed, but through this event I hope that his memory will live on in our community, and the money raised help find a cure for this most cruel disease. I think he would be proud that, through this event, he is helping to find that cure! Entry is by donation, of $10 per vehicle. Click here (or button below) to enter! Remember, when you enter you are automatically in the draw for some great prizes.